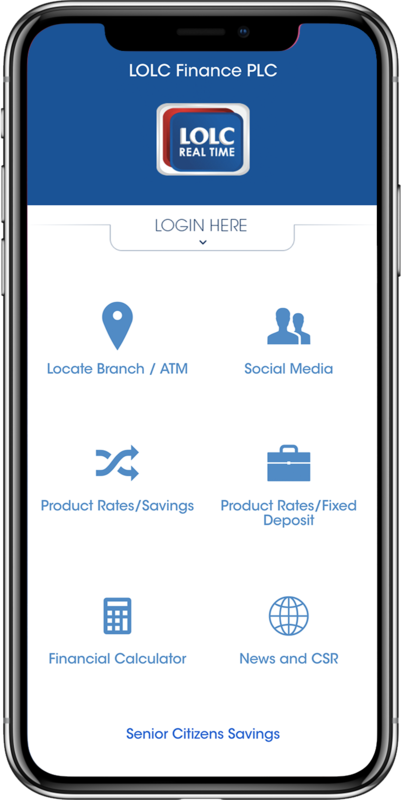 LOLC Real Time is an award winning mobile and internet banking solution which enables LOLC Finance customers to send and receive money, instantly via CEFT (Common Electronic Fund Transfer Switch) and SLIPS (Sri Lanka Interbank Payment System). It is a fully integrated, online payment platform that offers unparalleled convenience with a superior level of speed, ease and security. Through LOLC Real Time, you can make your utility bill payments and schedule payments that can be processed at a future date. The app also facilitates LOLC Leasing and Insurance payments. You can enjoy attractive interest rates on LOLC Savings accounts, with a zero cost on any transaction of any value. Please visit any LOLC Finance branch located island wide to register with the services of LOLC Real Time. Once registered, you could install the app by simply searching for LOLC Real Time on the Play Store for Android devices or App Store for Apple devices.